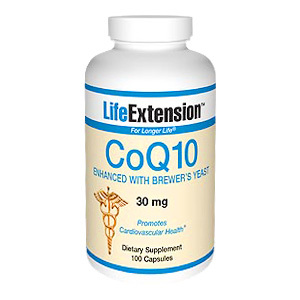 CoQ10 is required to convert fats and sugars into cellular energy, yet the natural production of CoQ10 declines precipitously with advancing age.3 When the body has an ample amount of CoQ10 the mitochondria can work most efficiently throughout the entire body, in cells everywhere, including the most densely populated area, the heart. Take one capsule one to three times daily with meals, or as recommended by a healthcare practitioner. Contains soybeans and wheat. Contains yeast, gluten, and rice. This product contains NO milk, egg, fish, crustacean shellfish (lobster, crab, shrimp), peanuts, tree nuts, or corn. Contains NO sugar, and no artificial sweeteners, flavors, colors, or preservatives. 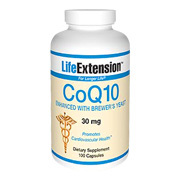 Enhanced COQ10 with Brewer's Yeast 30 mg is shipped in a discrete, unmarked package. Orders are processed immediately and usually take about 3 to 5 working days to be received. We do ask that you try it for 2 to 3 weeks to feel the full effects. Any information received is used only for order processing and shipping purposes. Your information, such as e-mail address, will never be disclosed to a third party.